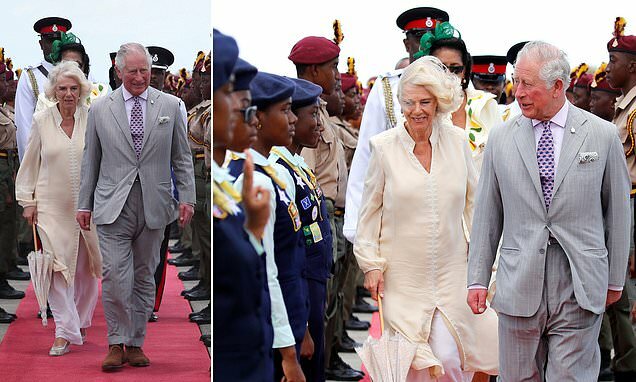 The Prince of Wales and Duchess of Cornwall today flew to the fifth stop on their whirlwind tour of Caribbean - and received a warm West Indies welcome. The couple are in Grenada where they will learn more about local agriculture and the history of cocoa and spice production on the island. Charles and Camilla are currently on a marathon 12-day tour of the region, visiting six countries in 12 days and undertaking a staggering 50 engagements, despite both now being in their seventies. They have already taken in St Lucia, St Vincent, Barbados, St Kitts and Nevis and will tomorrow become the first British royals to ever visit communist Cuba in an historic four-day visit. Camilla has teasingly hinted that she and her husband may even be tempted to try their hand at some salsa. The tour is being undertaken at the request of the British Government to strengthen and highlight diplomatic, political, economic and cultural ties in the region.